Drive your own speed speed boat for 40 minutes through the mangrove channel (the oceans jungle) to the world's 2nd largest reef. Snorkel there for 45 minutes and see lots of fish. Then you drive back again. 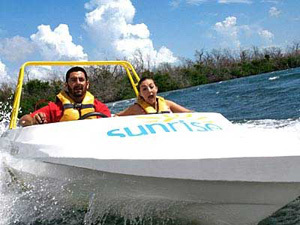 This is one of Cancún's most popular tours. During high season space is very limited and extra deposit required if booking 6 or more people.